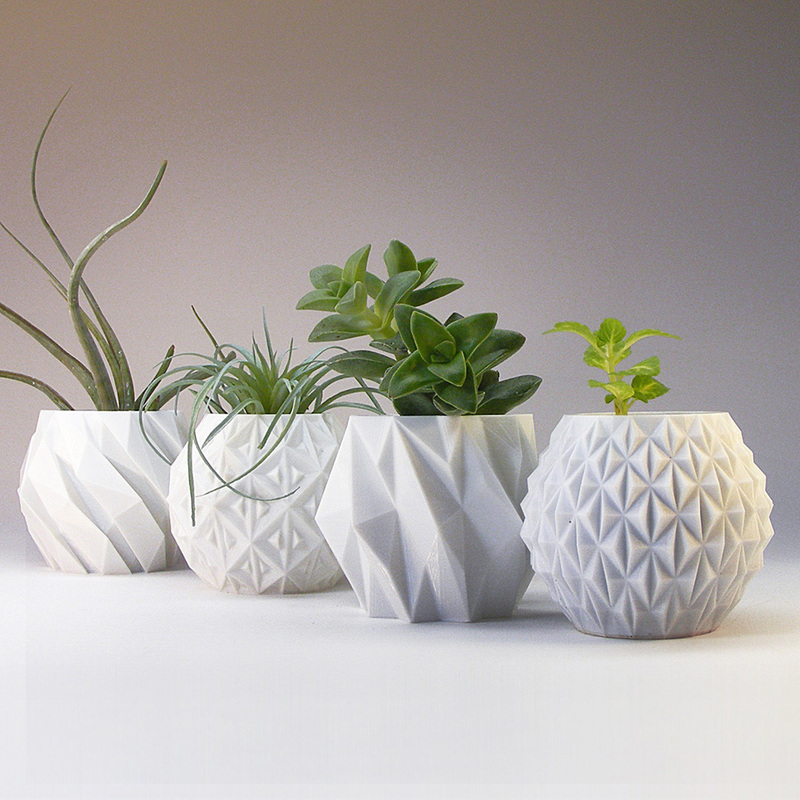 Interior designers love 3D printing! Using this technology they can produce amazing decorative items of most unusual shapes and designs, in various sizes and colors, and in different materials, to match their particular interior design projects. Best of all, the 3D printing process is fast, cheap, and eco-friendly. 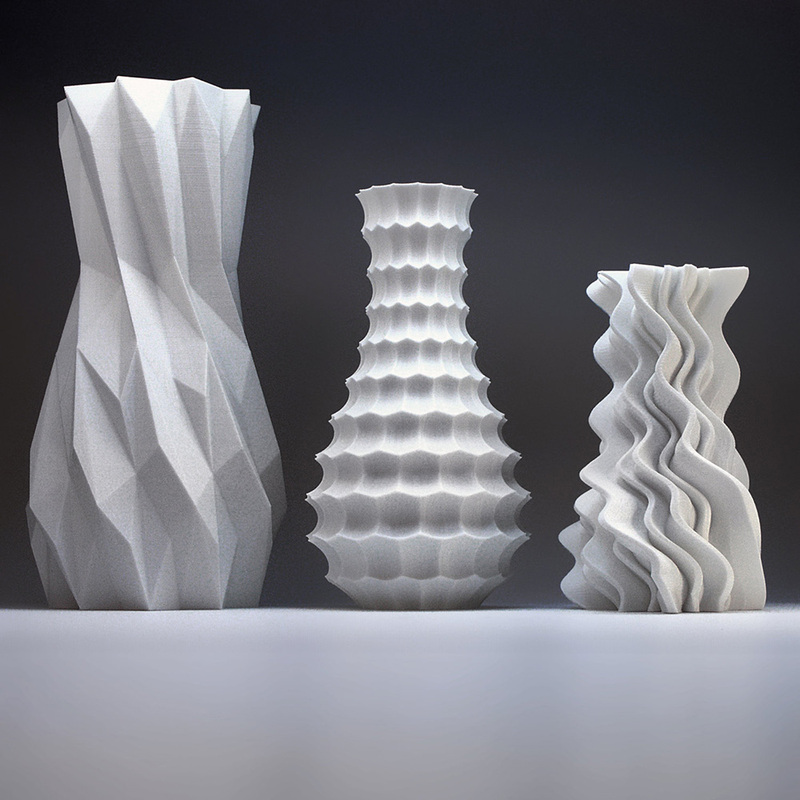 One of the top favorite 3D printing applications in interior design are the stunning 3D printed vases. 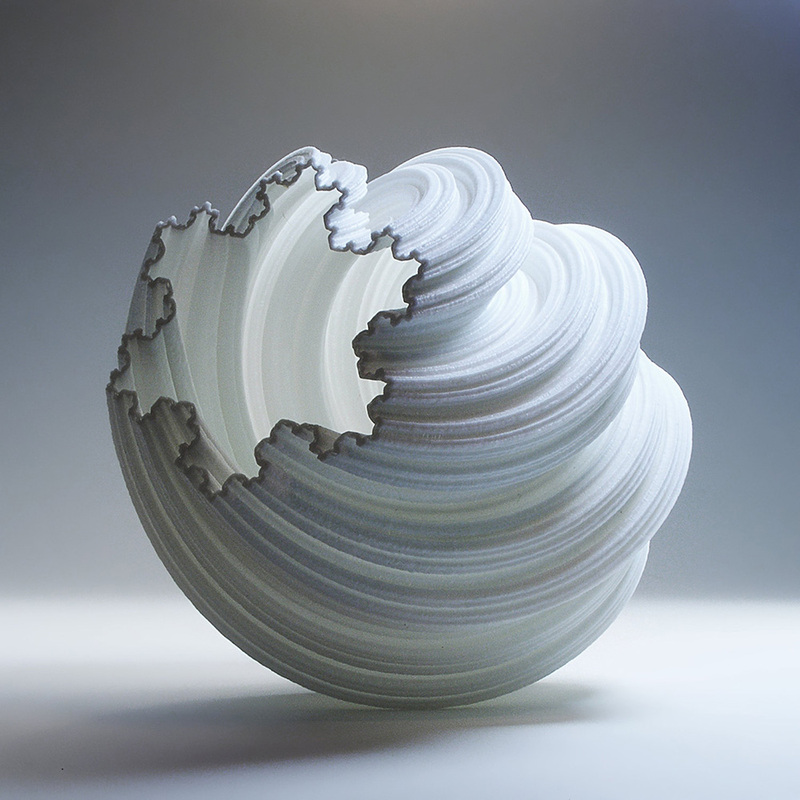 The computer generated patterns offered by the 3D printing technology are practically unlimited as far as design is concerned. Pair this with the ever growing assortment of materials used for the actual 3D printing process and you will get a better idea about the almost endless number of 3D printed items of stunning looks, functionality and applicability. 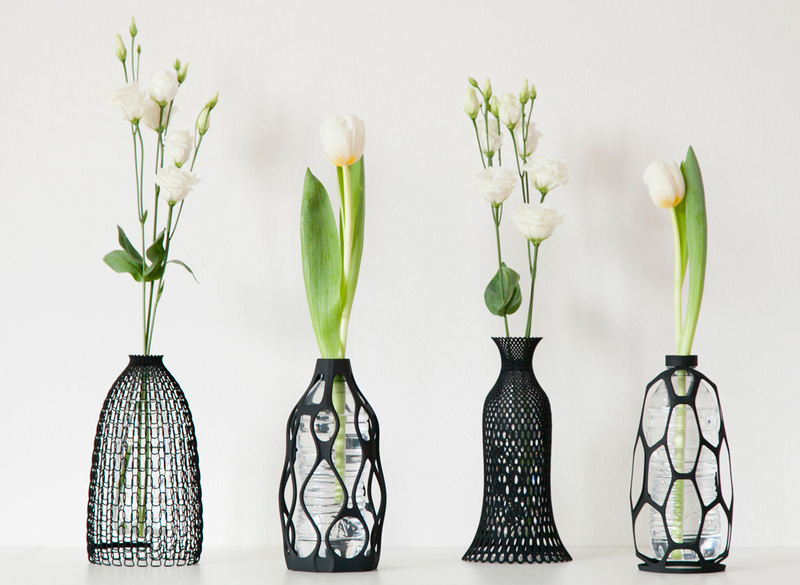 Here are a few examples of adorable 3D printed vases for your adorable home. 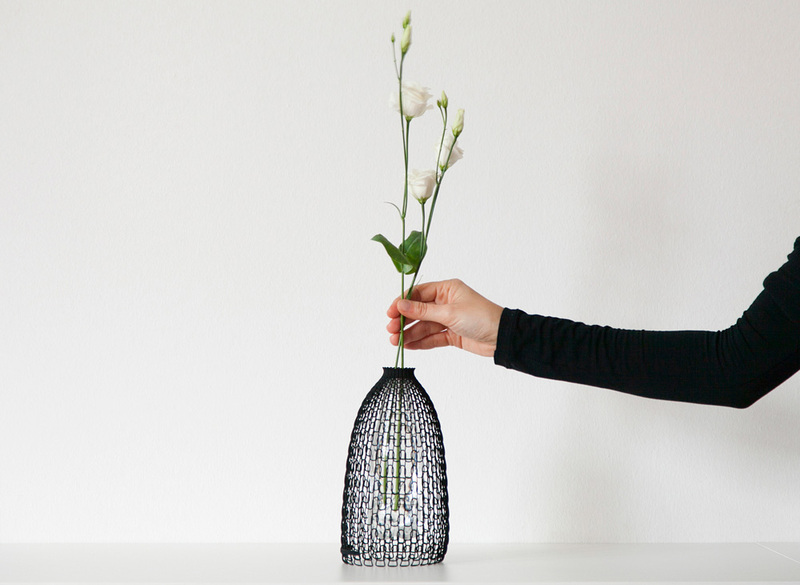 This collection of stunning vase designs by DesignLibero is the result of the creative power of 3D printing technology paired with eco-friendly upcycling of simple PET bottles. 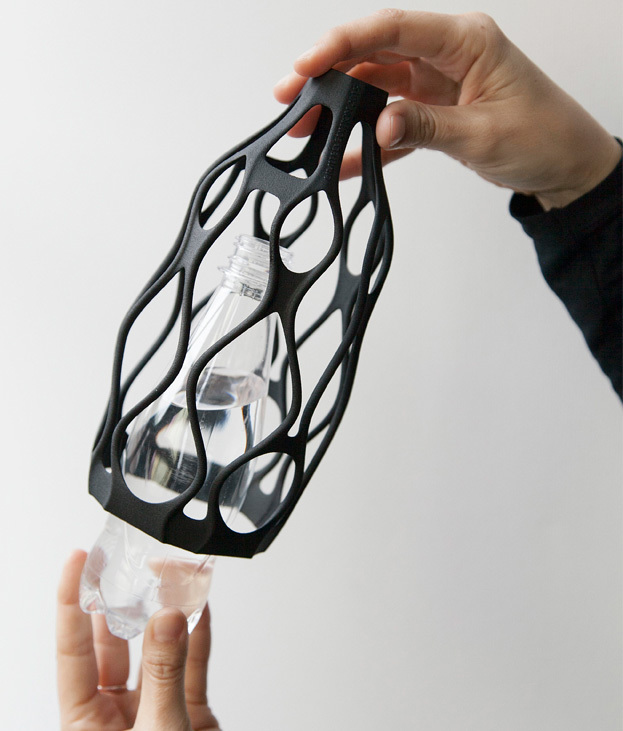 Each vase is a 3D printed delicate mesh shell which fits a ½ l. PET bottle inside, and is conveniently screwed in the bottle neck opening. 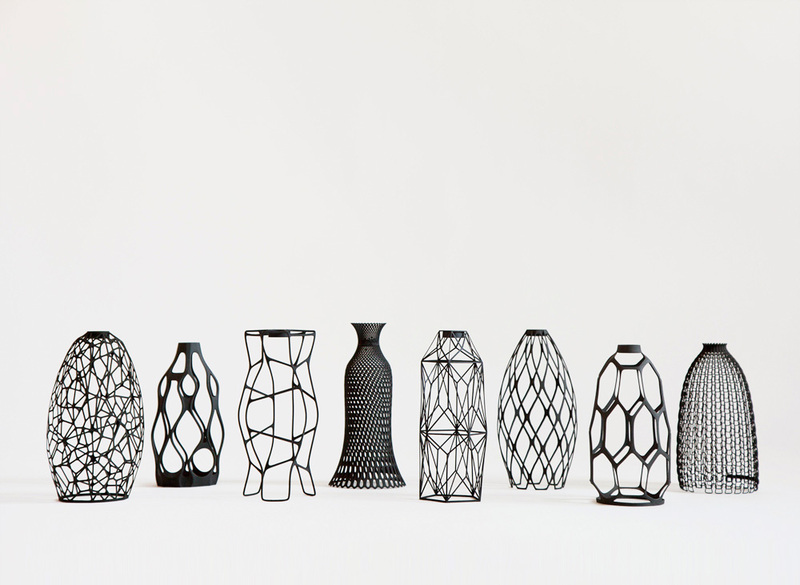 The collection offers 4 different designs of beautiful patterns: the simpler biomorphic pattern of the “Spider Vase”, the classical crochet-inspired pattern of the “Lace Vase”, the elegant wavy curves of the “Sinuous Vase”, and the extraordinarily fine pattern of the “Knitted Vase”. All 4 designs are available for 3D printing using white or black Polyamide. 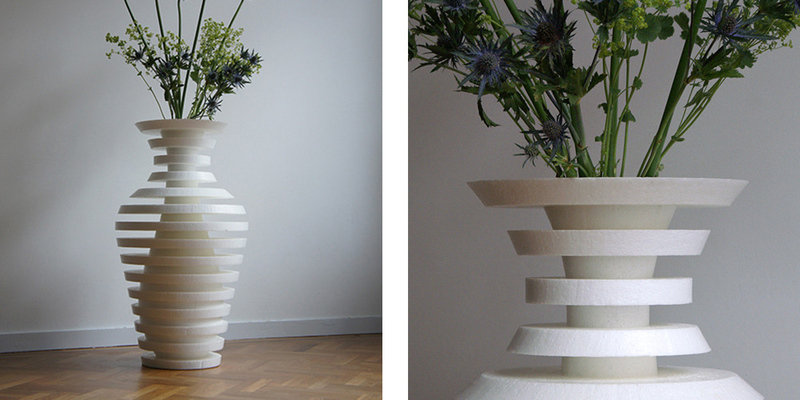 This elegant 3D printed item is a product of the Dutch design boutique OOOMS. It was designed to express the sense of splitting the mind or fragmenting of the creative thought processes. That’s how it ended up in having two shapes. The exterior is inspired by the classical ancient Greek amphoras, while the interior shape is inspired by the brass Indian flower vases. It is offered in white and black and is made of EPS and cork. 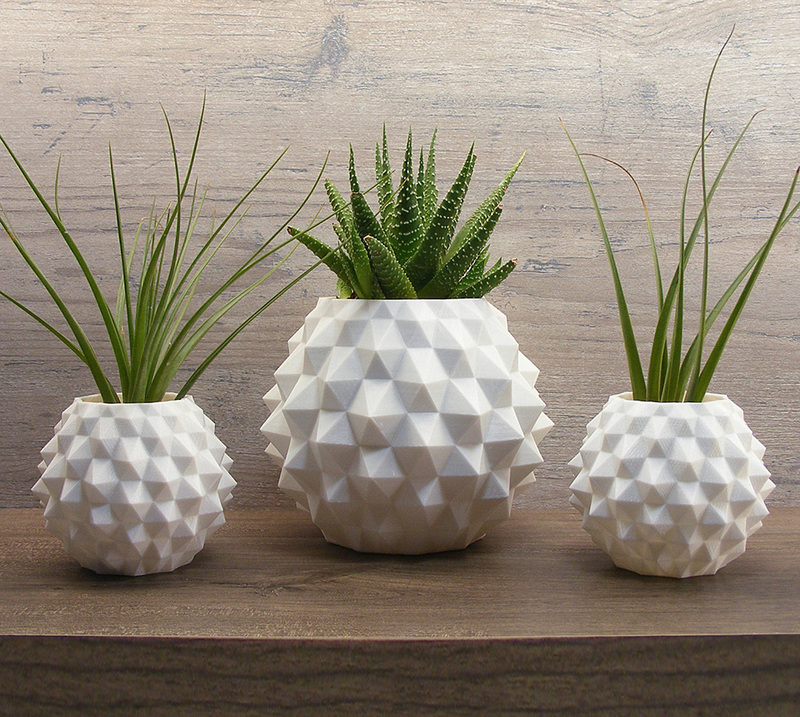 These unique and stylish planters have not come down from the wheel of a pottery artist. 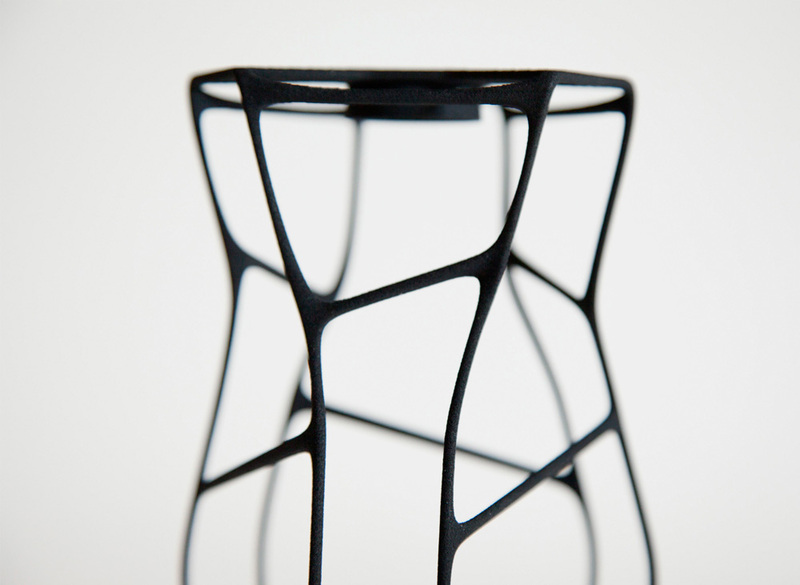 Their design has been computer generated and turned into physical items through 3D printing. They are made of a natural and eco-friendly plastic material derived from corn sugar. 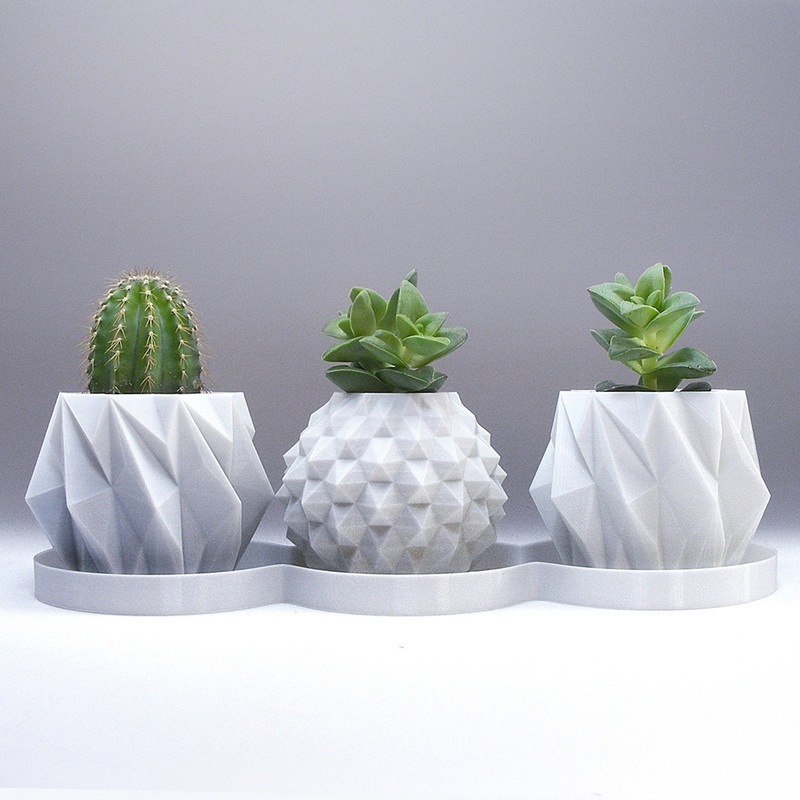 Separately or in a set, these adorable planters would fit any interior style. Get them from MeshCloud via Etsy.